Great Ideas — 20 Before & After Projects — Part One!! I love a great makeover, upcycle or refashion! Be sure to check out all of the AMAZING projects linked up this week! Great Ideas — 20 Before & After Projects: part two!! Link Party Palooza — and $100 Walmart Giveaway! Great Ideas — 20 Before & After DIY Projects!! 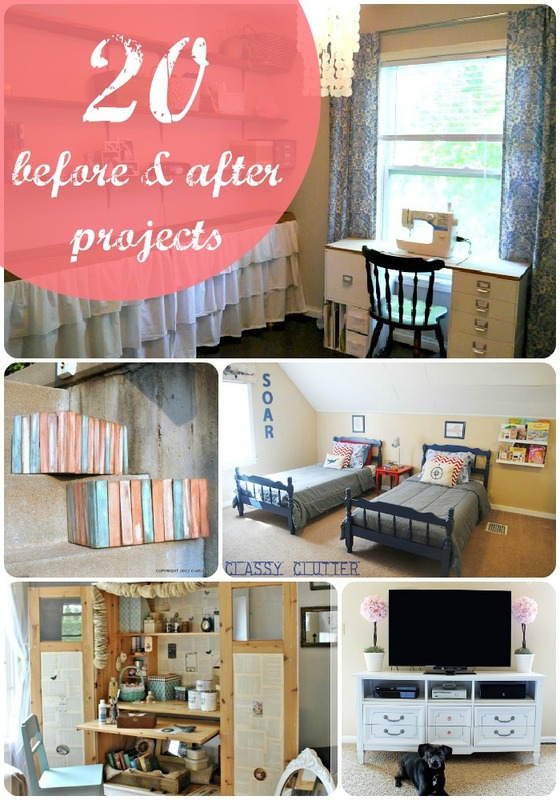 Great Ideas — 28 Before & After Projects!! Great Ideas — 20 Colorful Projects to Brighten Up YOUR Home! Great Ideas — 15 Tasty Summer Recipes!! Thank you for featuring my patio curtains!!! I love it! Thank you for featuring my wood shim crates! Thanks for featuring 2 of my puff paint projects! 🙂 These are very inspiring afters! I love it–I am newly inspired! Thanks! Jen, thank you so much for featuring the Horchow inspired lamp shade among all the other beautiful features. It made my day.